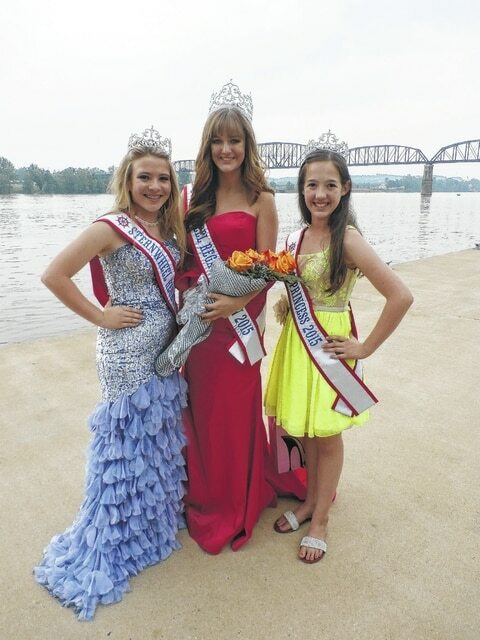 The 2015 Point Pleasant Sternwheel Regatta Royal Court consists of Queen Katlynn McKinney at center, Teen Queen Anna Litchfield at left and River Princess Kortlan Bush. POINT PLEASANT —The Point Pleasant Sternwheel Regatta kicked off Thursday night by crowning pageant royalty. The 2015 Regatta Royal Court consists of Queen Katlynn McKinney, Teen Queen Anna Litchfield and River Princess Kortlan Bush. Winning Most Photogenic were Kenly Arbogast in the River Princess Division, McKenzie Roush in the Teen Queen Division and Haleigh Bonecutter in the Queen Division. Joining Bush in the River Princess Division were Miss Congeniality Kelsie Hunt, Second Runner-up Emma Tomlinson, First Runner-up Kenly Arbogast. Joining Litchfield in the Teen Queen Division were Miss Congeniality Josey Rollins and First Runner-up McKenzie Roush. Joining McKinney in the Queen Division were Miss Congeniality Whitney Dyke, Second Runner-up Brittani Hancock, First Runner-up Alexandra Luikart. Also joining this year’s royalty were the 2014 Regatta Queens, Queen Lyndie Layton, Teen Queen Emma Rice, River Princess Maggie Kincaid. The pageant is under the direction of Jessica Willet. The Miss Maritime pageant will be 5:30 p.m. Friday in conjunction with the Little Miss/Mister Showboat and Pretty Baby contest on the main stage. Contestants can still register for the Pretty Baby and Little Miss/Mister pageant beginning at 3 p.m. Friday at the main stage at Riverfront Park. Registration is $15 per child and will last until 5 p.m. If you have pre-registered, you can pick up your contestant number at 5 p.m. at the stage.